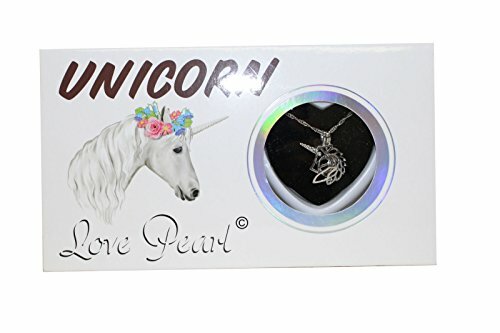 Unicorn Love Wish Pearl Kit Chain Necklace Kit Pendant Cultured Pearl in Kit Set With Stainless Steel Chain 16"
Harvest your own pearl in this awesome Love Pearl Kit! 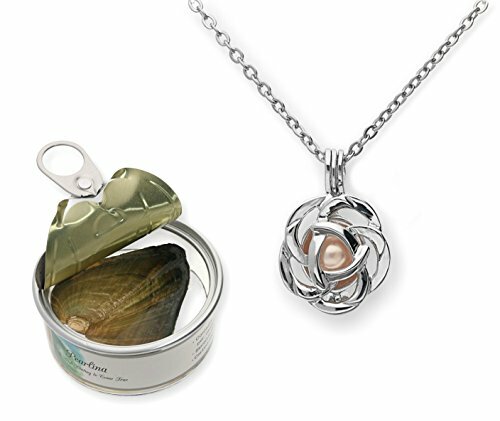 Comes with necklace, with a real freshwater oyster from which you will harvest your very own pearl! Box color and pendant design may vary. Great as a gift for that special someone in your life! Great holiday gift item! Real love takes time to grow, just like this unique pearl. Experience the thrill of opening one of nature's most perfect gifts, a freshwater oyster. Please enjoy the beauty and surprise this kit has in store for you. God created Women and Pearls, each takes time to grow to their full potential as intended. Treat both with respect and love that they deserve, love is eternal and life should be enjoyed to the fullest. A glittering Pearl awaits you to brighten your mood guaranteed! This is the perfect gift to tease your curiosity and test your luck. Please make a wish and enjoy the Health, Happiness, Love, Wisdom and Wealth that each unique Pearl color symbolizes. 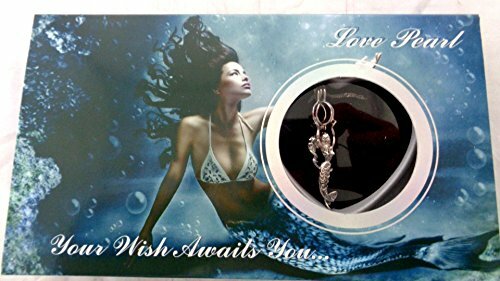 Make a wish and open the sealed can, cut open the oyster, and take out your pearl, put your new pearl inside the silver plated necklace included in the kit. Great as a gift for that special someone in your life. Great holiday gift item! 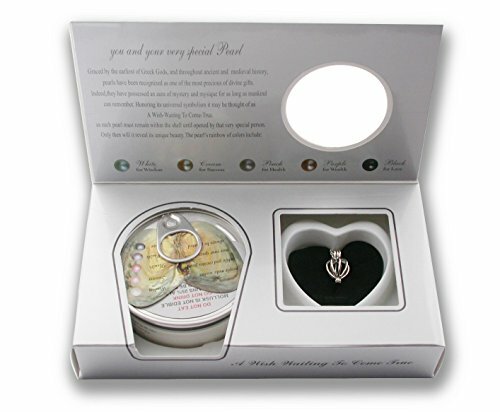 Harvest your own pearl in this awesome Love Pearl Kit! Comes with necklace, with a real freshwater oyster from which you will harvest your very own pearl! Great as a gift for that special someone in your life! Great holiday gift item! 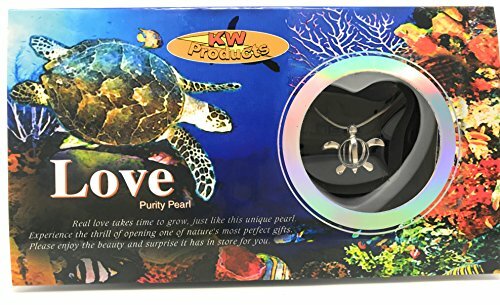 Love Wish Pearl Kit Chain Necklace Kit Pendant Cultured Pearl in Kit Set With Stainless Steel Chain 16"/ Great Gift Box 6 styles to choose from Love wish Pearl with 16" chain Necklace Real love takes time to grow, just like this unique pearl Experience the thrill of opening one of nature's most perfect gifts Enjoy the beauty and surprise it has in store for you! we provide a 14-day return policy Click The Yellow Add To Cart Button At The Top Of This Page To Order One Of The Love wish Pearl Styles. 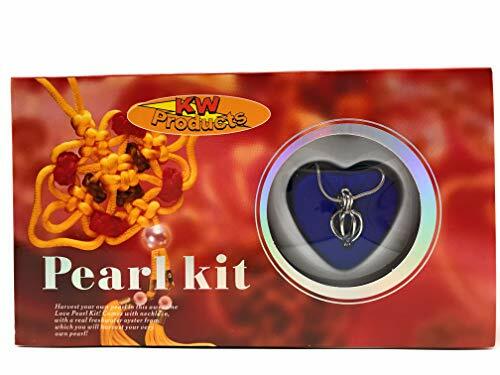 Pearlina Wish pearl Kits and Love Pearl Kits Only nature could create such a perfect gift, guaranteed to thrill whoever receives it The mystery and excitement that goes in the process of opening the oyster and finding your very own special freshwater cultured pearl is unmatched. 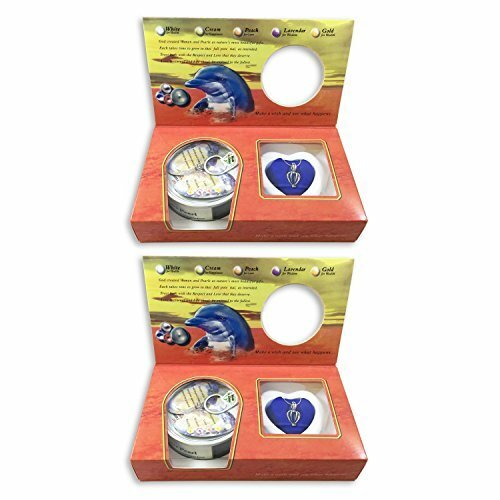 Each gift set includes: 1- An oyster containing a freshwater cultured pearl 2-A Cage locket 3-18" long chain 4- Instruction Booklet 5-Tool to open oyster (Butter knife can also be used with caution). A major appeal of this unusual gift is the excitement and mystery as the recipient opens the oyster and finds their very own freshwater cultured pearl. It takes three to five years for the oyster to form the freshwater cultured pearl. The freshwater cultured Pearl color will vary and some pearls are dyed. 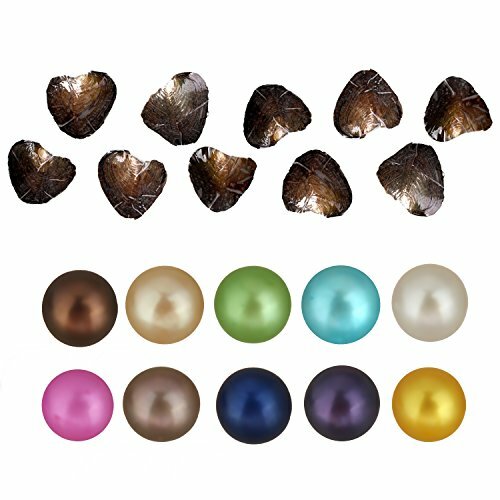 The freshwater cultured rainbow of colors include: The White for Wisdom The Cream for Success The Peach for Health The purple for Wealth The Black (dyed) for Love The Freshwater cultured pearl will measure approximately from 5-7mm. Make a wish first before you open the can to get the freshwater cultured pearl out. open the tin, who knows? your wish might come true........... Exterior packaging color and design may vary. About MilkyWay MilkyWay was established in 2000, especially produce various kinds of Jewelry. We provide High quality fashionable and popular products in reasonable price. Our purpose is:provide the best products to customers.Be the best jewelry providers.High quality manufacture We have advanced product lines,professional workers and experienced top designers.After-sales Service We promise we will provide our best products to customers and make sure the delivery will be in time.If there are some unexpected issues,please feel free to contact us,and we will do our best to solve them to get your satisfaction.Pay Attention 1. We have our own factory for MORE THAN 15 years with professional experience. We can reduce costs better and control the quality strictly. 2. Please kindly allow 1-2 cm differs due to MANUAL MEASUREMENT. 3. Colors may appear slightly different via website due to computer PICTURE RESOLUTION and monitor settings. Pearlina Rose Flower Cultured Pearl Oyster Necklace Set Silver Plated Pendant w/Stainless Steel Chain 18"
Oysters with twin Peals are wonderful gifts for Valentine day, Mothers Day, Christmas, Wedding, Anniversary, Graduation, Birthday, Bridesmaids, Prom and Formal Events. Possible colors are White,Pink, Dark Blue,Yellow,Green,Brown,Blue,Purple,Off White,Orange ect. Pearl size: 7-8mm Note: The shape of the pearl is nearly round, there is may some different from each other, please make sure that you don't mind this before placing the order. Thanks for your Kind understanding! Pearl Color Meanings: Blue: The wearer will find love Black or gold: Wealth and prosperity Pink: Success, fame, and good fortune Brown: Practicality, masculinity, dependability, and harmony White: Innocence, beauty, purity, and new beginnings Instructions: Open the pearl mussel , then reveal special color pearl--> remove the pearl from the mussels--> Hang the cage with pendant/earrings mountings-->carry your wish and love with you beautiful pearl pendants, earrings or rings. You can play with your little girl or boy to open the pearl oyster,it's happy parent-child time,we think you will love the pearls which open the oyster and get buy yourself. 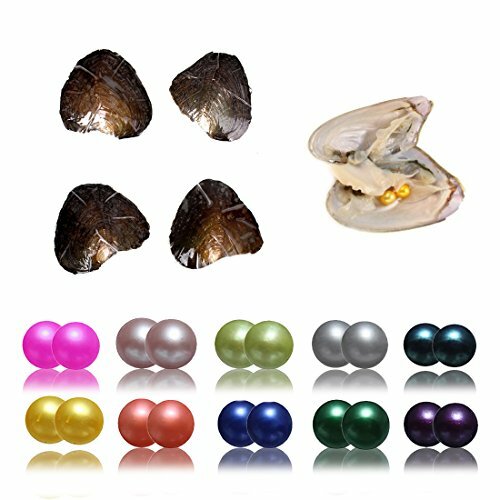 Compare prices on Love Pearl at Elevelist.com – use promo codes and coupons for best offers and deals. We work hard to get you amazing deals and collect all avail hot offers online and represent it in one place for the customers. Now our visitors can leverage benefits of big brands and heavy discounts available for that day and for famous brands.